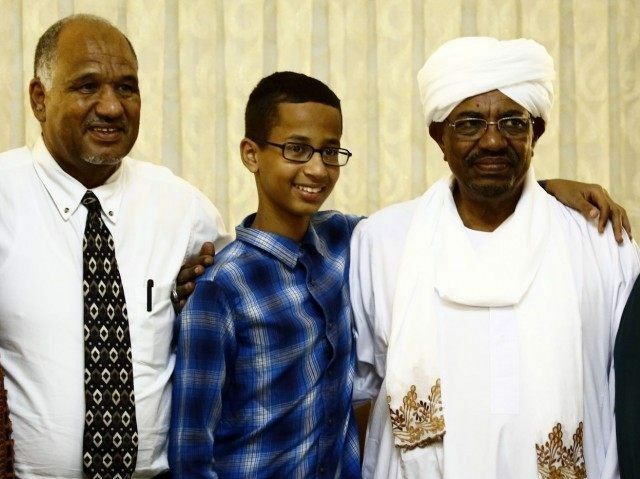 Ahmed Mohamed, the Texas youth who was briefly detained Sept. 14 when he brought a clock-like device that looked like a bomb in to school, met with Sudan’s genocidal dictator Oct. 13. He also posted a vine of his arrival in the country. Once in Sudan, he met the country’s president, Omer Hassan al-Bashir, who is still waging genocidal war against minorities, according to critics. “Today al-Hassan [the father] and his son spoke graciously of Bashir who according to Sudan official news agency (SUNA) honored him in tribute to his intelligence and talent and in line with government policy of caring for gifted youngsters. “Mohamed told reporters afterwards that he is ‘extremely delighted’ for meeting Bashir and visiting Sudan. He expressed hope that he would have the opportunity to meet again with the Sudanese president ‘with a new invention and success,'” according to a Paris-based, English-language Sudanese newspaper. It is not clear if Ahmed will bring his clock-in-a-box to the White House, or if Obama will choose to meet with him. On Sept. 17, he said was detained “because I’m Muslim,” during an interview on the al Jazeera network, just three days after the incident. Al Jazeera is a pro-Islamist TV network by run the autocratic leader of Qatar. “There is a lot of stereotypes [sic] for people who are foreigners and [when] they have Muslim names… names mainly in Islam… no this would not have happened to any of my classmates,” the youth said. Irving officials “should apologize,” he said.